More than conveyors of facts, baseball writers act as storytellers, uncovering fantastic tales where they exist and inventing them where they do not. But as anyone who has created a story knows, sometimes the characters don’t cooperate, instead wandering along paths no longer suited to the narrative and hiding away where the writer cannot reach them, forcing newspapers to be riddled with jettisoned, incomplete stories. This is what happened to the 1940 Cubs. Nestled amongst these contract disputes was the beginning of a soon-to-be abandoned story in the form of a press conference with Pittsburgh Pirates’ manager Pie Traynor. Though mostly run-of-the-mill, toward the end of the session, a reporter asked Traynor about the Cubs, declaring them a mystery. Traynor agreed, adding that the team could contend if the pitching of Bill Lee and Clay Bryant panned out.2 Though the Cubs did not end up contending, this was not the last time they would be titled the season’s mystery team. Over the first month of the season, the team performed as expected. Veteran pitchers Bill Lee and Dizzy Dean both pitched poorly, and Clay Bryant underwent surgery at the end of April, knocking him out for the rest of the season.4 Manager Gabby Hartnett was quickly limited to sporadic pinch-running appearances, which, when coupled with Phil K. Wrigley’s decision to assume baseball operations for the first time in his ownership of the team, left the manager frustrated and apathetic. But in mid-May, the team managed to string together five consecutive wins, stunning fans and reporters. This unlikely win streak added to the supposed mystique surrounding the team, as it was believed that no team who had used five different outfielders, three shortstops, two first basemen, and two catchers was setting itself up for any sort of success. Though this win streak only moved the Cubs from fourth to third place and trimmed a mere 0.5 games off the standings, it provided an opportunity for writers to engage with the team’s potential. The win streak featured excellent pitching performances by Larry French, Claude Passeau, and a moderately rejuvenated Bill Lee. Offensively, the outfield of Hank Leiber, Jim Gleeson, and Bill Nicholson dominated, a trend that would continue for the remainder of the season. This string of success opened the possibility of pennant contention in the eyes of Phil Wrigley, who believed the team was only one player away from reviving its success. That player was Eddie Miller, the Boston Bees’ shortstop and one of the best players in the game. 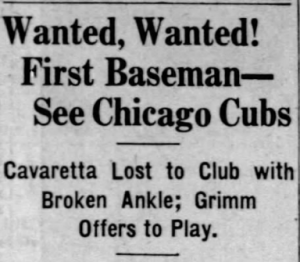 When the streaky Cubs lost 10 of 13 to close out May but then entered June by winning seven in a row, Wrigley chased after Miller, determined to land the player but unwilling to pay the $100,000 asking price. The talks carried on throughout the month, with Wrigley emerging empty-handed, much to the surprise of many who had considered the sale inevitable. For the remainder of the season, the Cubs would have a revolving door at short, as the young Bobby Mattick proved insufficient with both the bat and the glove. As the season plodded forward, the team became riddled with injuries and mired by poor performance. Second baseman Billy Herman nursed a twisted ankle throughout June, third baseman Stan Hack suffered from a concussion, outfielder Augie Galan broke both his kneecaps, and both first basem en were lost for July and August, Phil Cavarretta with a broken ankle and Rip Russell with an appendectomy.5 Adding to the woes was the pitching staff, as rookies Jake Mooty and Vern Olsen suffered from arm fatigue and Dizzy Dean requested to be sent to the minor leagues. Though both Ken Raffensberger and Charlie Root proved suitable pitching replacements, the offense sputtered throughout the remainder of the season, unable to overcome the injuries. Due to these tribulations, the talk of mystery surrounding the team dissipated, replaced by words of pity and bemusement. 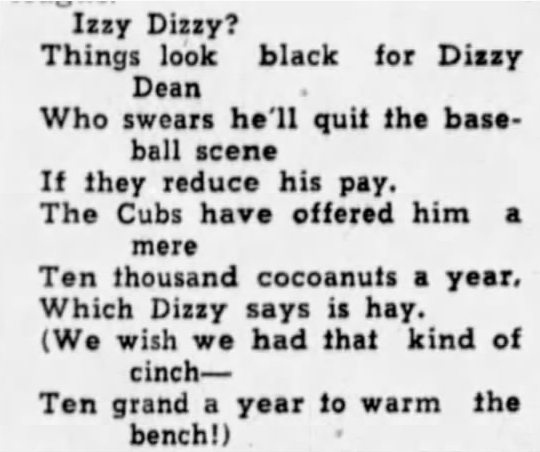 The concern shifted from how many games the Cubs would win to whether the team would have nine healthy men to field. There was no guessing what the team might do, just lamenting about what it had not done. Nobody asked Wrigley why he chose now to commandeer the team when he had before been so reluctant to even step foot in the ballpark. These things did not matter because the Cubs did not matter. The Cubs, of course, grew increasingly mysterious as the season progressed. Each game became shrouded in mystery as one was never sure from where Wrigley would pluck his lineup or which players would be out of position. Each mediocre start had fans asking whether there was any hope of Dizzy Dean reviving his career. 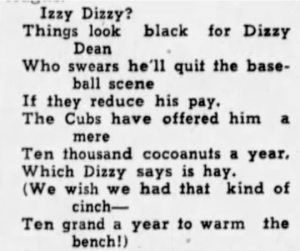 Each day raised questions about the team’s future that were compounded in the offseason as Wrigley fired Hartnett and GM Charles Weber, replacing them in some fashion with a number of new faces, such as Bill Veeck Jr. and Jimmy Gallagher. The September Cubs pulled off three miraculous winning streaks, each one more improbable than those five games in May. But none of these streaks and none of the questions they evoked was mysterious in the right way. As the potential of the Cubs waned, so too did the anticipated mystique. 1 Marshfield News-Herald, March 2, 1940, pg. 2. 2 Pittsburgh Press, February 14, 1940, pg. 21. 4 Arizona Daily Star, April 30, 1940, pg. 9. 5 Salem Daily Capital Journal, August 1, 1940, pg. 6.